YEKATERINBURG, February 2. /TASS/. Pykh the hedgehog from the Yekaterinburg zoo in the Urals largest city has predicted an early spring, a zoo official told TASS on Friday. "This is the second time Pykh made his prediction on February 2, Groundhog Day," Igor Permyakov said. "We offered him two plates with his favorite treats, mealworms. At first, the hedgehog selected the plate symbolizing the arrival of early spring and then came up to a plate signifying that this spring will not be sunny." "Pykh is a very active hedgehog and is not afraid of people," he added. He said that the zoo had selected hedgehogs to forecast weather as this tradition goes back to the days of ancient Rome. "We decided to continue this tradition," Permyakov said. Pykh is not the only animal who predicts weather in Russia. Others include Olesya the groundhog, who lives in the Nizhny Novgorod zoo, and Businka the bear from Chelyabinsk. Businka’s forecasts tended to be 90-percent accurate. Groundhog Day is celebrated in the United States and Canada on February 2. 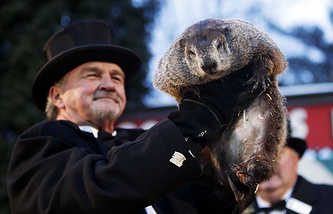 According to legend, if Phil, America’s most famous groundhog from the town of Punxsutawney, Pennsylvania sees his shadow, there will be six more weeks of winter weather. If he does not see his shadow, an early spring can be expected.